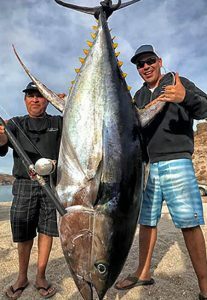 Mexican angler Jorge Lazo potentially set the new men’s 24 kg (50 lb) line class world record for yellowfin tuna (Thunnus albacares) with this massive 192.59 kg (424 lb 9 oz) fish the he caught on January 8th while fishing out of Loreto, Mexico. Lazo and crew were anchored and chunking with squid when the huge tuna hit, taking Lazo nearly two hours to land on the stand-up gear he was using. If approved, the catch will be the second heaviest yellowfin ever recorded by the IGFA, and would easily replace the existing record of 175 kg (385 lb 12 oz). American angler and recipient of the IGFA’s Lifetime Achievement Award, Dotty Ballantyne, potentially set the new women’s 6 kg (12 lb) tippet class world record for southern yellowtail (Seriola lalandi) with this 6 kg (13 lb 4 oz) specimen she caught while fishing of White Island, New Zealand on November 23rd. 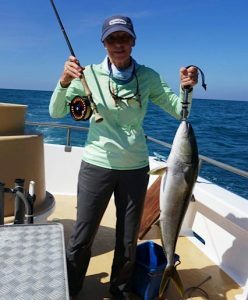 Ballantyne, an experienced fly angler, needed only 10 minutes to land the hard-fighting yellowtail after it ate the baitfish pattern fly she was casting. The current world record in this category is vacant. 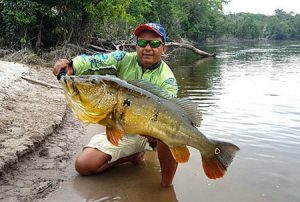 Brazilian angler Mariozan Gomes Do Nascimento possibly set the new All-Tackle world record for vazzoleri peacock (Cichla vazzoleri) with this beautiful 7.71 kg (17 lb) fish that he caught and released on September 26th while fishing the Rio Paratucu in Brazil. The potential record peacock hit a topwater plug that Nascimento was casting, and put up a tough five minute fight. If approved, the catch will replace the existing world record of 5.9 kg (13 lb). Ecuadorian angler Fernando X. Mata – age 10 – potentially set the new men’s 6 kg (12 lb) line class world record for broomtail grouper (Mycteroperca xenarcha) with this quality 11.68 kg (25 lb 12 oz) fish that he caught while trolling a diving Mirrorlure plug off Salinas, Ecuador on December 26th. 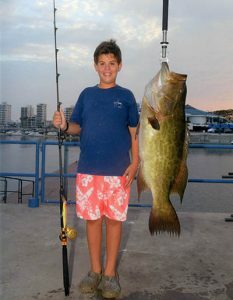 If approved, the catch will replace the current record of 7.26 kg (16 lb).